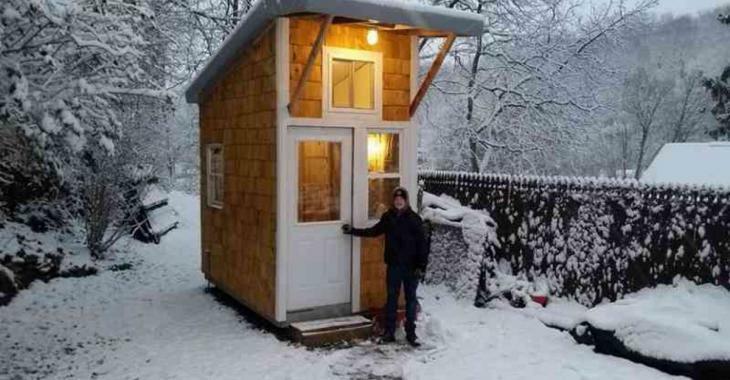 Crafts : He's 12 and he builds the smallest house ever seen in his garden! He's 12 and he builds the smallest house ever seen in his garden! This is exactly what happened to a 12-year-old boy from Iowa. Luke Thil was looking for something interesting to do on a hot summer day! He was tired of playing his video games and riding a bike and as the little houses fascinated him, he decided to build one! So he began to mow lawns, broom the garage of a local electrician and to do household chores at home in order to earn money and thus be able to cover the expenses to build his house. Watch the video below, it's hard to believe that the young man built the house with so little money! Luke recovered some remains of his grandmother's house, which included two walls of cedar and vinyl. And the doors and windows are also recovered, as well as the materials for his balcony. The inside of the house contains everything a house needs. A small kitchen with a countertop, and even a storage area with shelves. It really looks like a dream house. In the living room there is even an ottoman with storage from Ikea that Luke uses as a sofa, then a folding table on the wall. A TV hanged on the wall and a ladder leads to a magnificent loft upstairs, where Luke can even sleep because there is a mattress, as well as a fan because it is hot in summer and a smoke alarm is installed in the room. The tall boy of 1 meter 70 (5'7 "is very comfortable in the room.) Outside he planted flowers, plants and even tomatoes! A campfire is even in front of the house! This child proves how incredibly creative and valiant children can be! Now aged 13, Luke is very proud of his house and is already dreaming of his next construction! Watch the inside of the house in the video!